A tale of a girl, her yarn, and a pile of law books. I've been doing a little knitting. A few months ago I picked up some Mission Falls wool on clearance at my LYS. I wound up with 8 balls, and I made a few hats for the general election campaign with Knitters for Obama. We're trying to hit up swing states and focus on homeless veteran's charities. For the most part, I used Ellen's Knit Hat pattern, although I sampled the London Beanie and The Boy Hat. The other patterns were great, but I liked the first one best for simplicity purposes. These hats are my purse projects, and I needed something that I can just throw in a bag and go. I'm moving back to Tennessee next week, and I cannot wait. And when I say "move" - I mean, living/working there for the rest of the summer. It might only be 7 weeks, but it's going to be awesome. I can't wait to spend the 4th of July grilling out with my family. I've been in a funk - both in my knitting and my personal life. I've had a lot on my mind, and usually knitting works to help bring me out the funk that's going on. Not today. However - I'm trying! Since the Obama Knitting Mania, I've tried to keep working on a few smaller projects so that I'm at least being productive. I figure that one day I'll snap out of it if I just keep at it for awhile. The photos don't do the waffle stitch cloth justice. It makes a great textured cloth, but I'd recommend people use a solid or semisolid color. I think it would make it "pop" a bit more. I wanted something simple to work on while I was flipping back and forth between CNN and the Bourne Identity on cable. It really was a hard choice - Matt Damon being a badass or knowing what's going on with the Obama/Hillary neverending saga. In the end, Matt won. This hat turned out a little small. It fit me nicely, but it's for a charity knitting drive where most of the recipients will be men. I have a small head, and the other other adult that I've knit a hat for is the Boyfriend who has a HUUUUGE head. I realize that all men won't be competing with him for Largest Dome in North America, but I expect they'll be somewhere in between. If I make this hat again, I'd cast on extra stitches and knit an extra inch or two before doing the decrease rounds. It's a cute and simple pattern with lots of room for variations. Why yes.. I do know how to knit things other than baby hats! When Amy and I went to see the Yarn Harlot in April, we of course went yarn shopping. Busy Hands was having a sale, and I picked up Noro at 20% off. It was still a little on the pricey side, but I just couldn't pass it up. 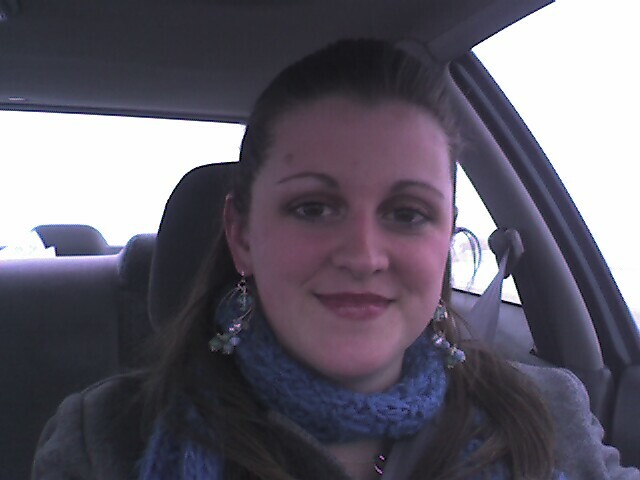 I cast on for this scarf almost immediately, but it took nearly a month to finish. Between exams and 35 baby caps, I had a few other things on my plate. I like how it turned out. I picked one colorway that was mostly pink and another that was blue/green. Every once and awhile the colors would be too similar, so I had to do some split splicing to make the stripes a bit shorter. I probably have the equivalent of 1/4 of a skein leftover. After blocking (although it really didn't need it, I just wanted to wash the cat hair off) - it wound up being 85" long. It wraps around my neck and still has enough "dangle" to make me happy. I'm a fan of long scarves. Although it's allegedly summer around these parts, we didn't get out of the 50's today. If this keeps up, I might get to use this scarf well before the fall! I've been knitting as many hats for Obama as I can, but I've started to burn out a little. It seems that a few of us are experiencing burnout after making a blue million of these guys. So, I decided that I'd have a contest to help us chug through the final few states. We still have primaries in Puerto Rico, South Dakota and Montana left to knit for. (The mailing dates have already passed for Kentucky and Oregon.) For every hat or bib that you knit for any of these three primaries, your name gets entered once in the drawing. I realize that we don't all support the same political platforms, and I support anyone's decision to chose another candidate. However, this charity drive is to drum up positive support for Obama's campaign and to show that we've taken Obama's message to heart. Seeing hundreds of baby caps being donated to a local hospital is a change that we all can believe in! Sign me up! How do I enter? If you're on Ravelry, sign up for Knitters for Obama. There's a thread that discusses all the ins out outs which will help you get started. You can knit either hats or baby bibs. Just make sure you use soft fibers which are machine washable. 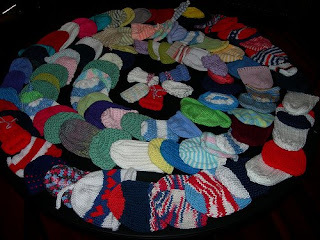 Just send either knittinggurl or knitnic a private ravelry message with the number of hats/bibs that you'd like to donate. When it gets closer to the mailing date, you'll get a ravelry message with the address to send your goodies. The moderators keep up with the tallies, and I'll put you in the drawing based on the number of donations that you have pledged. Don't have ravelry? No problem! Email me at goldendomer [at] gmail [dot] com and tell me how many hats you'd like to donate. I'll make sure your name gets put in the hat! Where do I find patterns? How soon do you need things? The primaries are coming up quickly. We try to get the donations mailed to the contact person in each state 10 days beforehand. The contest will end after the mail date for the last primaries! Enough of this Babbling! What do I win? I decided to go stash diving to see what I could come up with, and I remembered some Artyarn Regal Silk that I got on sale a few months ago. It's hard to part with this because I love it so much, but it's for a great cause! The prize is for two skeins, 163 yards each. It's 100% silk and uses a recommended needle size of 7. The retail price of this yarn is $22 a skein, and you can get it for free for just donating a few hours of knitting time to a great cause. As of 4:18 this afternoon, I am officially 2/3 of the way through law school. It felt amazing to turn in my last paper for the semester. I finished up exams Tuesday, but I still had a bear of a paper to finish. Before they unleash us onto the world as lawyers, we have to satisfy this enormous writing requirement. I decided to get mine out of the way this semester, and it feels like a HUGE weight has been lifted. To celebrate, I got take out sushi, poured myself a giant glass of wine and plopped in front of the tv and knit another hat for Obama. I haven't gotten much accomplished other than hats these days. And these went wee wee wee, all the way home. Or, maybe just to West Virgina. I'm in a Ravelry group called "Knitters for Obama." They got a little fed up with the negative media that was happening in this election, and decided to do something about it. In each state that still has a primary, they are collecting baby hats & bibs to do a mass donation in honor of Obama. We all know how much I love knitting baby hats, so I had to contribute a few. The plan is to use the campaign colors (or, quite honestly, whatever you have in your stash). 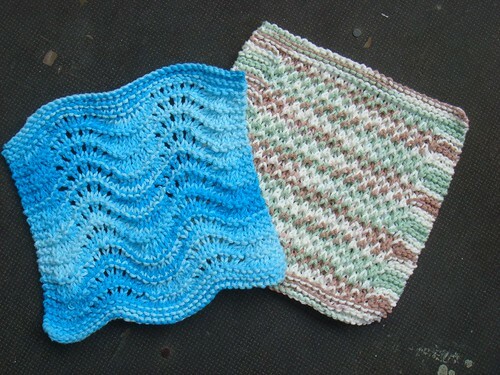 I ran over to Jo-Ann's and picked up some Caron Simply Soft in red and white, and some Vanna's Choice in Blue. They didn't quite have the right color of blue in Caron at the time, so I did a little mix and matching. I like the results! These little things knit up pretty fast, so I'm hoping to get a few more than my initial pledge of 6 completed. They've collected about 100 for the Pennsylvania primaries, and the movement seems to be gaining momentum. If you're interested in donating a few, see this thread for details. On Friday, the Yarn Harlot was in Ann Arbor, and Amy and I went down to see. We did a lot of yarn shopping, and for the most part, I was good. I did accidentally buy some Noro to make a striped scarf while I was at Busy Hands. Oops. They were having a 20% off the entire store sale. Resistance was futile. We got to the library an hour early, but we still had to sit in the overflow room. Rumors were flying that people started getting there as early as 1pm for a 7pm talk. I think I preferred yarn shopping. She was really funny, and I laughed the whole time. I must confess, I don't read her blog as religiously as others, but I didn't realize she would be quite so much fun. We stood in line for hours to meet her. Literally. We were the last people to get in line, and we didn't leave the library until 10:30 at night. We happened to get in line behind people that were fun and chatty, so the time went by a lot faster than it could have. It doesn't look like much of a line, but this was how many people were ahead of us after about an hour and a half of standing around knitting. It was a great night, and I'm so glad that I went. Although there was one rather awkward moment of the night. Random Lady: You could have went to the front of the line! Me: (puzzled look) What? Why? RL: Stephanie loves women like you! Ummmm... I'm not pregnant. Apparently just fat. It's much cuter than the bitter face that I was still sporting after the earlier comment. This is a Flickr badge showing public photos from amandadeering. Make your own badge here.